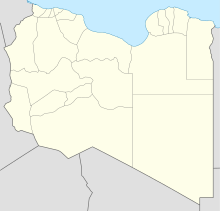 Ras Lanuf Oil Airport (ICAO: HLNF) is an airport in the Sirte District of Libya, located on the Mediterranean coast 227 kilometres (141 mi) south-southwest of Benghazi. Its primary use is the transportation of oilfield workers from production facilities in the area. The Ras Lanuf V40 non-directional beacon (Ident: VR) is located on the field. Maurer, Maurer. Air Force Combat Units of World War II. Maxwell AFB, Alabama: Office of Air Force History, 1983. 521 p. ISBN 0-89201-092-4. ^ Airport information for HLNF at Great Circle Mapper. ^ "Ras Lanuf V40 NDB (VR) @ OurAirports". ourairports.com. Retrieved 2018-08-21. Airport information for Ras Lanuf Airport at World Aero Data. Data current as of October 2006.